The virus spreads so quickly that is has been especially difficult to track it and figure out exactly what ebola does to human body. Learn the latest findings. According to Medecins Sans Frontieres (MSF), the French designation for Doctors Without Borders as well as the World Health Organization (WHO), the Ebola virus is one of the world’s most deadly diseases. It is a highly infectious virus with no cure that carries with it a mortality rate of up to 90 percent killing almost all who catch it and spreading terror among infected communities. The Ebola virus is a particularly devastating disease. Even those who survive must still yet recover from the havoc the disease wrought upon their internal systems. One can only hope that, by working together, we can finally find a cure and stop this catastrophe from occuring again. With drugs such as ZMapp showing real promise, this dream may soon become a reality. What exactly does the ebola virus do to the body, which makes it so deadly? 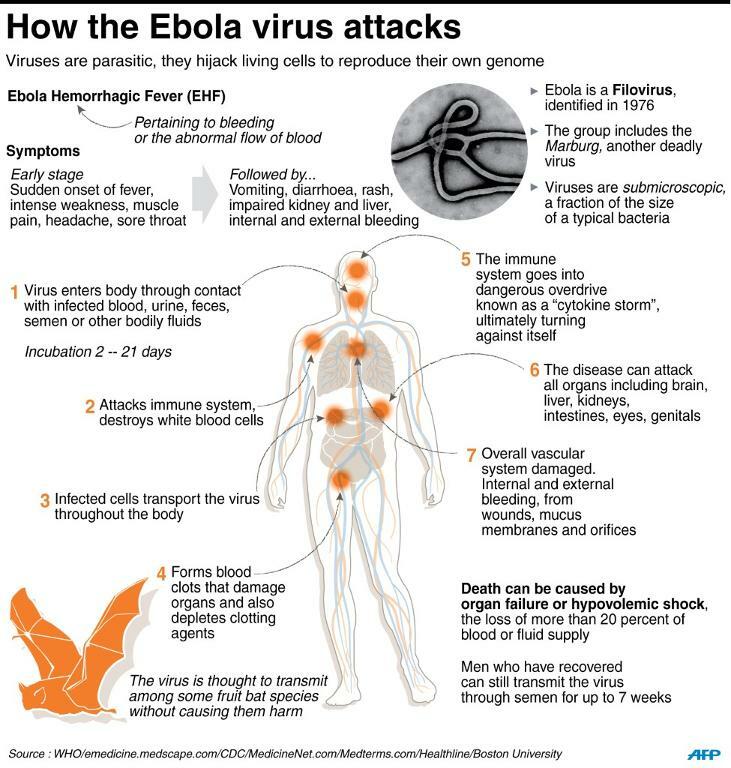 How Does the Ebola Virus Affect the Body? There are currently five known subtypes of Ebola. The first strain to be identified is known as the Zaire strain and is widely considered the deadliest form of the virus. In the current outbreak in West Africa, preliminary testing by the WHO have suggested that this is the strain responsible and may explain the record breaking number of deaths the virus has claimed thus far. The Ebola virus is a severe acute viral illness and as such, individuals may begin to exhibit early symptoms such as the sudden onset of fever, general weakness, muscle pain, chills, headaches and sore throat. As the disease progresses, the symptoms worsen and include nausea and vomiting, diarrhea, bloody stool, bloodshot eyes, rash, chest pain and coughing, stomach pain, severe and rapid weight loss, bruising, bleeding from various orifices (most commonly the eyes), internal bleeding and impaired kidney and liver function. The Ebola virus is a systemic infection. What this means is that every organ and tissue, except the bones and skeletal muscles, are under constant attack. 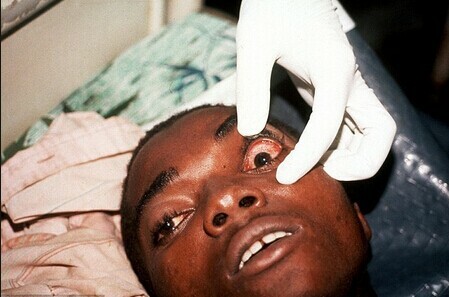 The Ebola HF is marked by blood clotting and hemorrhaging. We have still not completely figured out exactly how the virus works. One theory is that the virus particles may release proteins which weaken the body’s immune system response thus rendering it unable to defend itself. We believe that Ebola’s first offensive maneuver is the targeting of certain types of immune cells which would normally be our body’s first line of defense against illness. The virus attacks and infects the body’s dendritic cells which are responsible for the activation of T cells (the white blood cells we use to fight infection) which would normally kill off the infected cells before they could spread. With the dendritic cells compromised, the T cells are not activated and the virus begins to multiply in a very rapid fashion. Ebola also, similarly too many other viruses, inhibits interferon which is a molecule that cells make use of to further retard viral reproduction. After that it is somewhat a guessing game to the exact process, but what we do know is that virus attacks the connective tissue and reproduces at an extremely fast rate in the collagen (collagen is what keeps our organs where they belong), effectively digesting the tissue as it does this. Another major factor in the Ebola virus’s system wide attack on the body is its ability to form blood clots. Forming small clots early on, the virus causes the patient’s blood to slowly thicken, resulting in a decreased blood flow. As the clots begin to get stuck in the blood vessels, the patient begins to exhibit external signs in the form of red spots on the skin. As the disease progresses, these clots and their tell-tale spots increase in size. Another more serious effect of the Ebola virus’s clotting factor is the decreased blood supply to the vital areas of the body such as the liver, brain, kidneys, lungs, intestines, testicles and extremities. Entering the final stages of the disease’s progression, the patient may begin to exhibit spontaneous bleeding from their eyes, ears, nose as well as tears in the skin which can appear suddenly. Death generally occurs due to a catastrophic drop in blood pressure resulting from the damage done to the blood vessels and massive blood loss. Death may also occur due to multi-organ failure and/or shock. Ebola virus has no cure and as such cannot be treated specifically. With early symptoms that can be easily attributed to several other diseases such as malaria, shigellosis, cholera, leptospirosis, rickettsiosis, relapsing fever, hepatitis, typhoid fever, meningitis, the plague or a number of other viral hemorrhagic fevers, confirmation of the Ebola virus can only be confirmed by laboratory testing. What can be done is to keep the patient well hydrated and treating any symptoms and/or secondary infections they develop along the way. Patients are often administered oxygen therapy, intravenous fluids, blood transfusions, medications for the treatment of shock and pain medications to help them cope with the pain. Experimental drugs are currently being tested as well. Infected with the Ebola virus, two American missionary workers were treated with an experimental drug known as ZMapp which appears to have worked as both are alive and well. This was the first time the drug had been administered to humans, but it had previously shown promise while being tested on primates. Unfortunately, there are few doses of ZMapp ready and deploying an experimental and largely untested drug during an outbreak carries with it its own set of problems. With several other experimental treatments currently in the works, it looks hopeful a cure will be found. There are currently 15 separate institutions working on developing a cure for the Ebola virus and in March of 2014 a five-year, $28 million dollar grant was awarded to them by the U.S. National Institute of Health to promote a collaboration between them and hopefully enable them to find a cure. Now you know what does ebola do to the body and other helpful info.